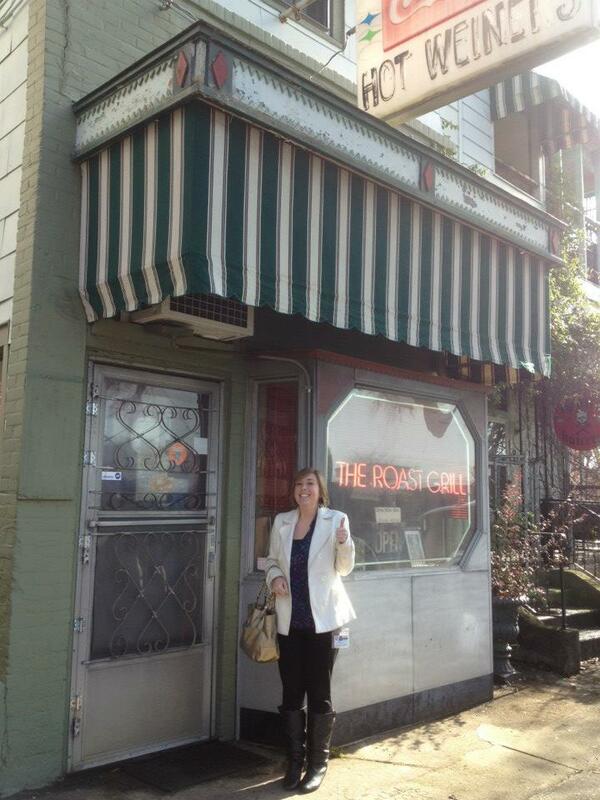 The Roast Grill is simply charming. This local hot dog establishment in historic downtown Raleigh has been around since 1940 when it was founded by Mrs. Mary Charles and George Poniros. Pony up to the small counter and take a seat on an old fashioned stool. You&apos;ll definitely want to order a glass bottle of Coca-Cola and take in the antiques displayed in the restaurant. Spend only a few seconds debating the menu. I promise, it&apos;s pretty simple. 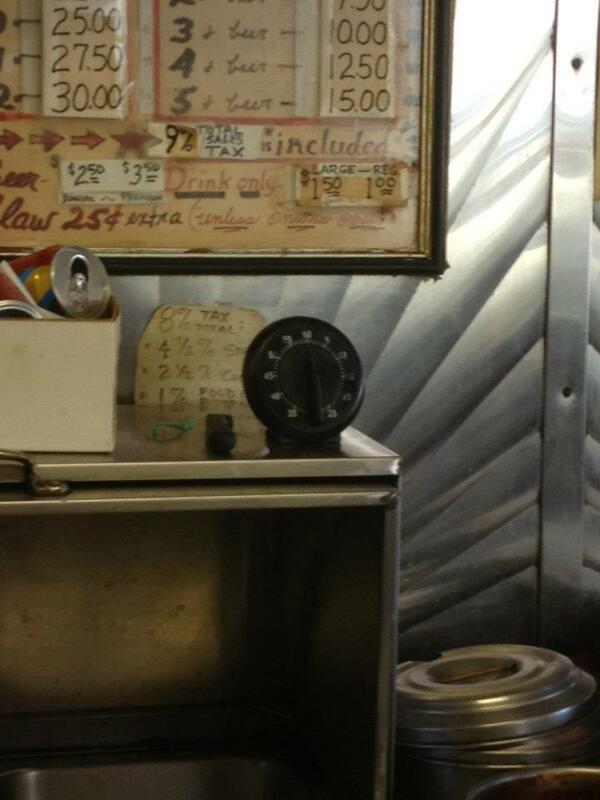 The menu lists the price of one hot dog all the way up to 20 hot dogs. 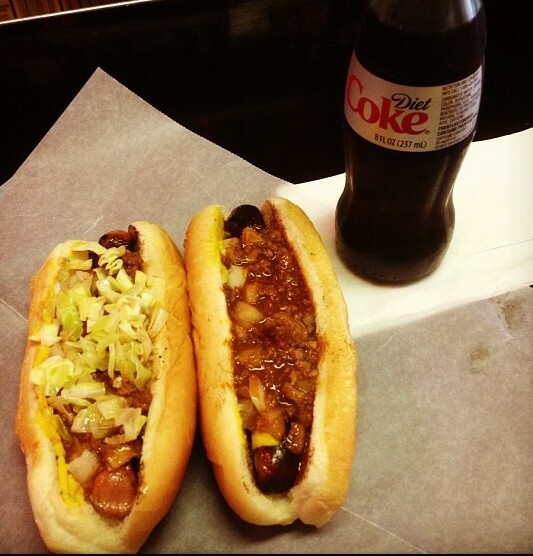 You can order a hot dog with a combination of mustard, homemade chili, slaw or onions. That&apos;s it. Don&apos;t you dare ask for ketchup or you&apos;ll ruin the flavor of The Roast Grill&apos;s homemade chili, which has been dished out on these grill-blackened, southern-style hot dogs since the very beginning. The Roast Grill is famous for their hot dogger eating challenge. Adam Richman from Travel Channel&apos;s Man v. Food successfully downed 17 hot dogs with chili and mustard within the one hour time limit. However, he didn&apos;t beat the record. The men&apos;s record for the hot dogger eating challenge is 26 hot dogs! One day I was enjoying lunch at The Roast Grill when the insane idea occurred to me that I needed to participate in this challenge. I wanted my picture hanging on the wall with Adam Richman, mainly to make my dad proud. Dad loves The Roast Grill, and when he&apos;s visiting the area from Charlotte he always eats a burnt hot dog with chili and mustard. So, I called George a few hours after my lunch to tell him that I would be competing to beat the women&apos;s record, 13 hot dogs in one hour. I was extremely nervous and excited before making my grand entrance under the faded "hot weiners" sign and through the screen door to The Roast Grill. It was game time! Thankfully, I was wearing stretchy pants and a shirt to strategically hide my future food baby. My college friend, Ches McDowell, and I competed in The Roast Grill competition yesterday during lunch. 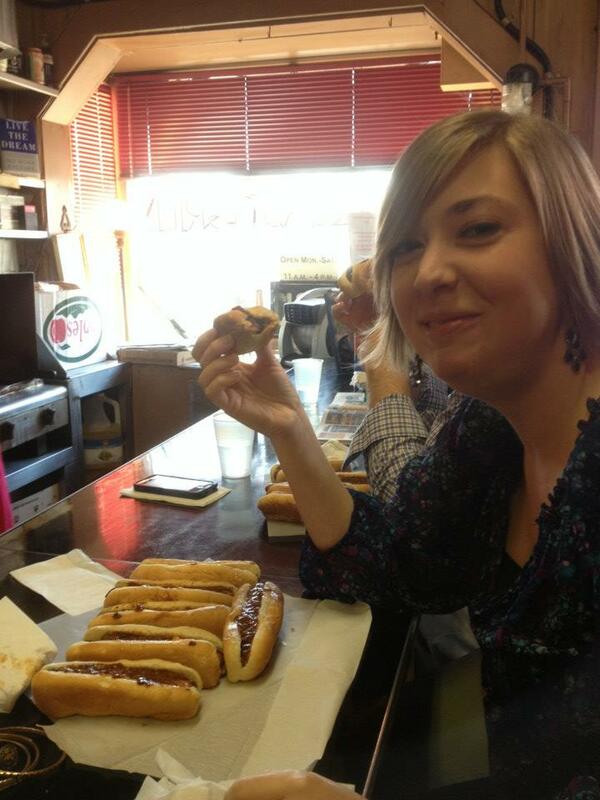 Ches needed to eat 27 hot dogs, which seemed monstrous compared to my 14 hot dog challenge. 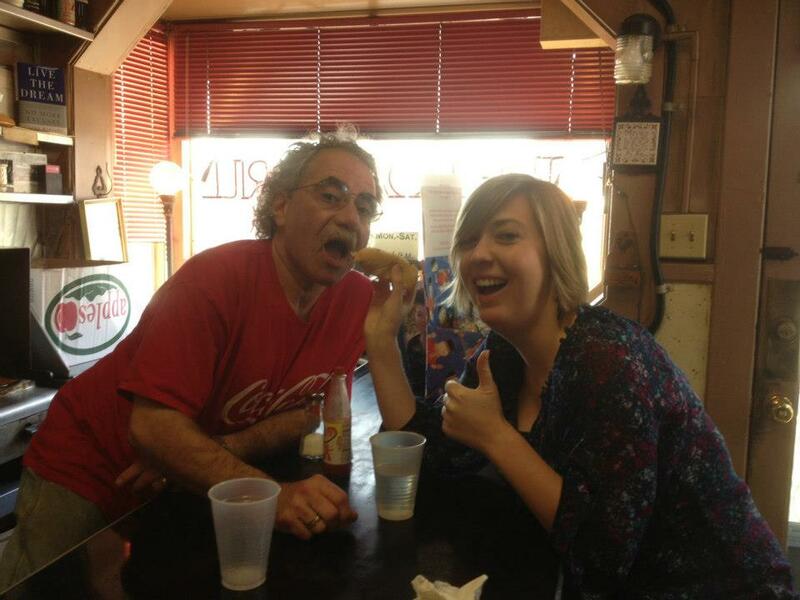 Before the competition, I paid George a dollar for each hot dog I would be attempting to eat. He joked by saying that we could have a piece of his mother&apos;s homemade baklava for dessert at the end of our lunch! We swapped stories with George , who loves his regular customers and always remembers their orders. Ches told George that he came to The Roast Grill with his dad for his 21st birthday and first legal beer. However, it didn&apos;t take George too long to get serious. He lined up a row of hot dogs for Ches and me, turned his back to us and started the dreaded timer. One hour to down 14 hot dogs? I was feeling confident. It was all fun and games, hanging out with my crowd of friends, coworkers and spectators. The first five hot dogs went down with no problem. I remember saying after number five, "I&apos;m still hungry!" I&apos;m telling you, I can eat. I successfully finished ten hot dogs in 30 minutes. I still had a smile on my face and George was on my side. He believed in me. 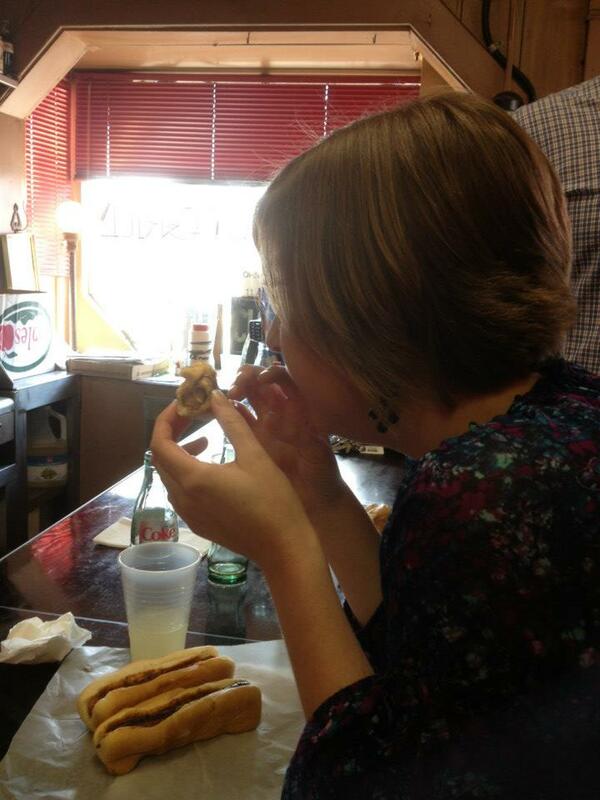 I only had three more hot dogs to go to at least tie the woman&apos;s hot dogger eating record. Ches started slowing down after eating 11 hot dogs and asked George for a Diet Coke. I decided that it would be a good idea to wash down the last few hot dogs with a Diet Coke as well. We were clearly watching our calories too; no need for a regular Coca-Cola! After a few swigs of soda, Ches had to step outside for some fresh air. Oh, no! I started to feel the Diet Coke bubbling in my stomach. How would I ever get these last few hot dogs to settle in, what I thought, was my bottomless pit of a stomach? That was my mistake. I should have stuck to water. I was slowing down. I had about 15 minutes remaining to eat two hot dogs to tie the woman&apos;s record or three hot dogs to be the new champion. I told my audience that there was no way I could do it and began doubting myself. My coworkers, Adam and Michelle began whispering words of encouragement in my ear like, "I know you want this!" and "You can do it!" My mouth was salty and I felt like my body was going into shock. George switched my beverage to lemonade to see if that would help. I felt like I was about to lose my lunch all over the counter. I was done. The timer dinged and I could only finish 13 hot dogs. There was no way I could cram one more hot dog down. 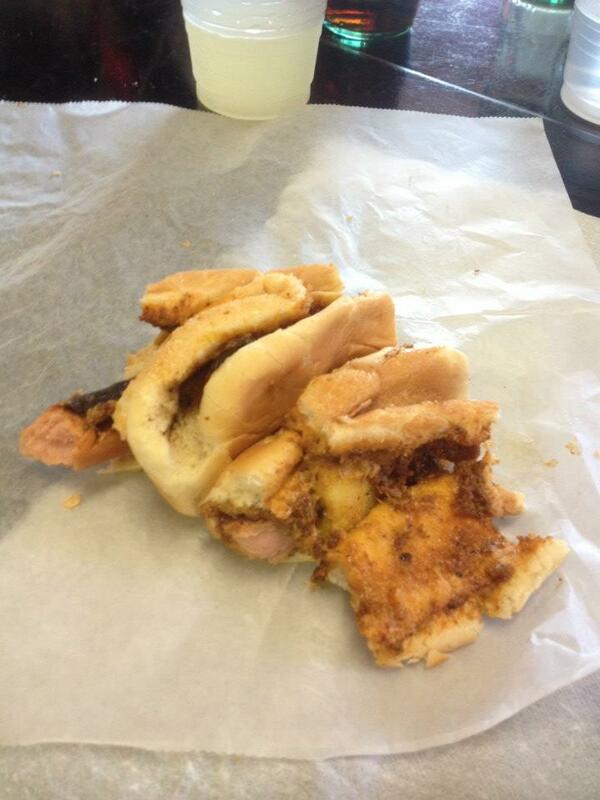 I looked at the fourteenth hot dog&apos;s remains that I had attempted to eat and suddenly felt sick. George led me to the bathroom and you can only imagine what happened next. 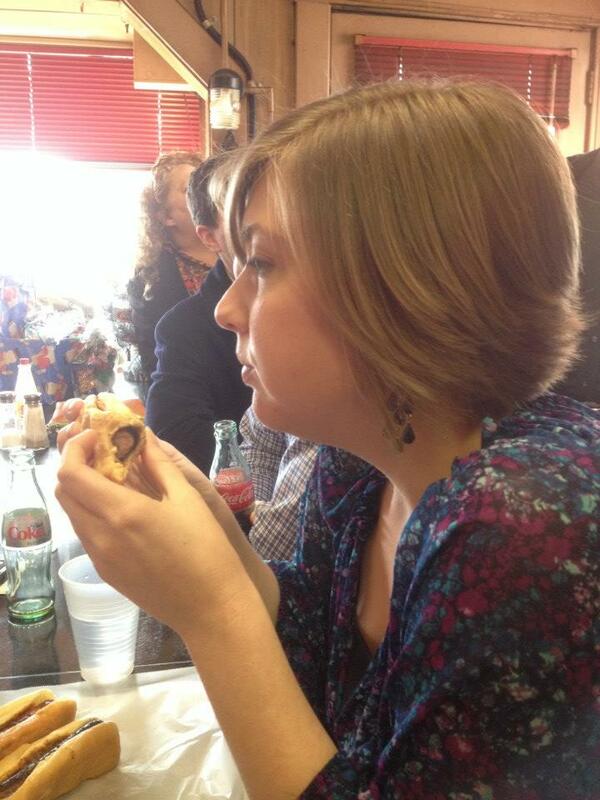 Luckily, I&apos;ll still get my picture on the wall for at least tying the hot dogger eating record. George gave me a Roast Grill t-shirt and sticker to remember my first eating challenge success. I didn&apos;t leave without the signature Tootsie Roll and a smile from George. I received applause from everyone in the restaurant on my way out. I was even asked to take pictures with customers who just happened to be eating lunch with an insane 23-year-old girl who ate 13 hot dogs. Apparently, they said I&apos;m a local celebrity now. So, was it worth it? Every minute. To say that my picture will be on the wall of The Roast Grill and to experience such a well-known Raleigh eating challenge is worth every hot dog and calorie. 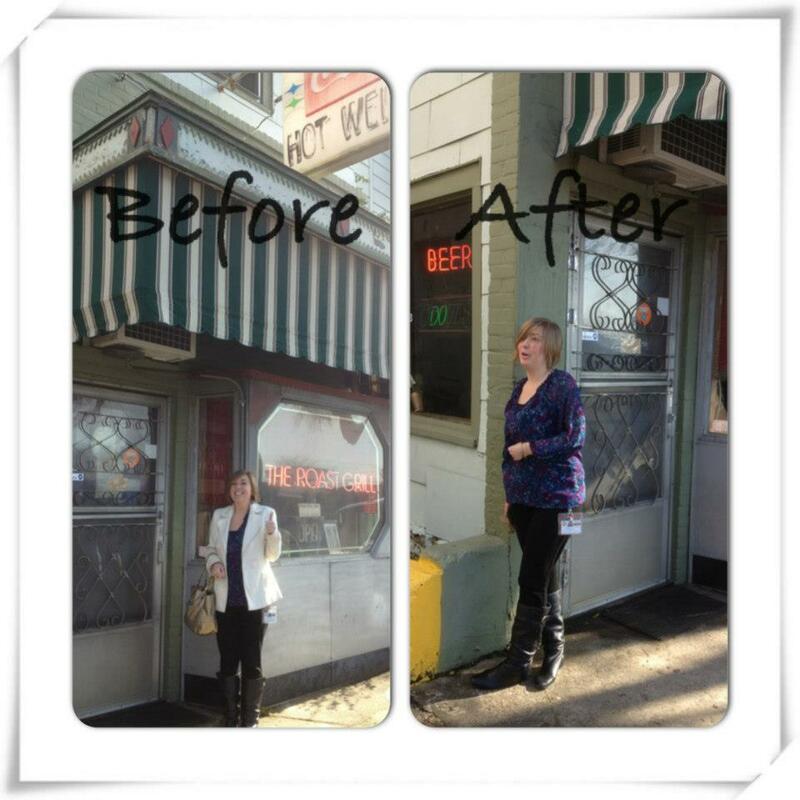 Remember when I told y&apos;all I would gain a few pounds during my Foodie blogging and hopefully make you laugh? Well, I hope The Roast Grill challenge exceeded your expectations. I&apos;ve never gained five pounds in one day and had this much fun! Anyone can participate in The Roast Grill Challenge. 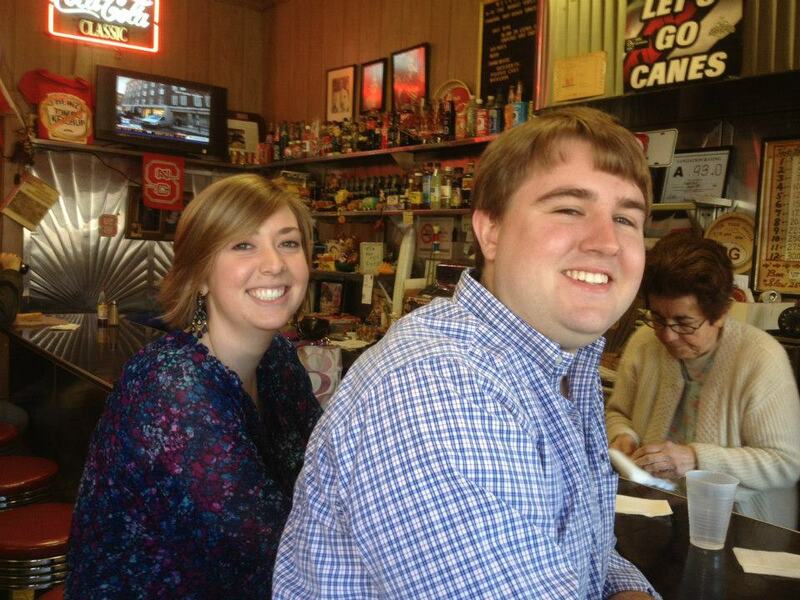 If you’re up to eating your weight in hot dogs, give George a call at (919) 832-8292.